Living, Leading, and the American Dream is an inspiration— and a call to action. Beginning with an exploration of Gardner's life and values in his own words, this stirring and engaging collection shares Gardner's vision on personal renewal, community, leadership, and civic engagement. The essays and speeches collected in this transformational volume are founded on Gardner's belief that we as a people want freedom— freedom at home as well as a world where freedom is possible. They are founded on his deep belief in the dignity and worth of the individual and his unshakable resolve to protect and preserve that dignity. They are founded on his belief that men and women should be empowered to achieve the best that is in them, and that we are the declared enemies of all conditions, such as disease, ignorance, or poverty, that stunt the individual and prevent such fulfillment. 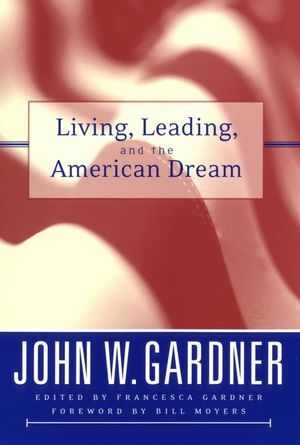 John W. Gardner (1912-2002) recipient of the Presidential Medal of Freedom, was an adviser to presidents and, to many Americans, a personification of citizen participation and volunteerism in a democratic society. Gardner was Lyndon Johnsons Secretary of Health, Education and Welfare, and a member of presidential panels during the Johnson, Carter, and Reagan administrations. PART ONE: A Life in Action—and Reflection. 1. Glimpses of My Life. Looking back I see a California boy finding his way through life, endlessly challenged, surmounting obstacles, falling on his face, always studying, always trying, always wondering. 2. In the President’s Cabinet. It was terribly important to respect the difficulty of the job, to respect the best people there, to respect the good parts of those who weren’t the best, and to understand the system even if it was your intention to fight it. As citizens we have every right to raise hell when we see injustice done, or the public interest betrayed, or the public process corrupted. PART TWO: The Courage to Live and Learn. Life isn’t a game that has a score. Nor a riddle that has an answer. Life is an endless unfolding, and if we wish it to be, an endless process of self-discovery. 5. How to Tell When You’ve Grown Up. It takes much longer to grow up than one might imagine. Live, Love, Learn . . . Dig your fingers into the soil. Acknowledge your roots. Know where you came from and the earth that nourished you. 8. The Qualities of Creativity. People think of creativity as a kind of psychic wonder drug, powerful and presumably painless; everyone wants a prescription. PART THREE: The Release of Human Possibilities. We have throughout history shown a compelling need to arrive at conceptions of the universe in terms of which we could regard our own lives as meaningful. We want to know where we fit into the scheme of things. 10. Motivation and the Triumphant Expression of Talent. Talent is one thing; its triumphant expression is quite another. . . . The maturing of any complex talent requires a happy combination of motivation, character and opportunity. 11. The Full Expression of Human Excellence. The question of excellence is only one of the many problems facing a free society. But it is a problem that cuts across all the others. 12. Our Moral and Spiritual Lineage. No one can measure the contagion of ideas, values, and aspirations as expressed in the lives and acts of individual men and women. PART FOUR: Leading and Managing. 13. The Nature of Leadership. The aura with which we tend to surround the words leader and leadership makes it hard to think clearly. Good sense calls for demystification. 14. The Tasks of Leadership. Any attempt to describe a social process as complex as leadership inevitably makes it seem more orderly than it is. Leadership is not tidy. 15. The Heart of Leadership. Executives are given subordinates; they have to earn followers. PART FIVE: Renewing Our Society. We are capable of so much that is not now asked of us. The courage and spirit are there, poorly hidden beneath self-interest and self-indulgence, waiting to be called forth. The process of renewal encompasses both continuity and change, reinterpreting tradition to meet new conditions, building a better future on an acknowledged heritage and the wisdom of experience. Individuals at all levels of society must be prepared to exercise leaderlike initiative and responsibility. Americans do not regard the furtherance of public purpose as a monopoly of government, and that belief has brought a great release of human energy. My deepest admiration goes to those many Americans who are keeping the Dream alive today. 21. Freedom and Obligation, Liberty and Duty. When we raise our sights, strive for excellence, dedicate ourselves to the highest goals of our society, we are enrolling in an ancient and meaningful cause.